As part of offering greater convenience for customers, NamNam has introduced a brand new experience through its web-based ordering and payment platform in January this year. Diners will now be able to order and pay immediately upon finding a seat and can self-collect their orders at the respective food and drink collection points. 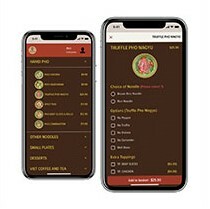 Those rushing for time but looking to fulfil their Vietnamese food cravings won’t have to worry no more as advanced orders for takeaway can be easily made through the platform. Visit the platform now to give it a try! Please use your device in portrait mode to view this website in the best conditions.